MetroPCS, the prepaid wireless service owned by T-Mobile, is set to incorporate one of its parent company’s popular service features into its own plans. 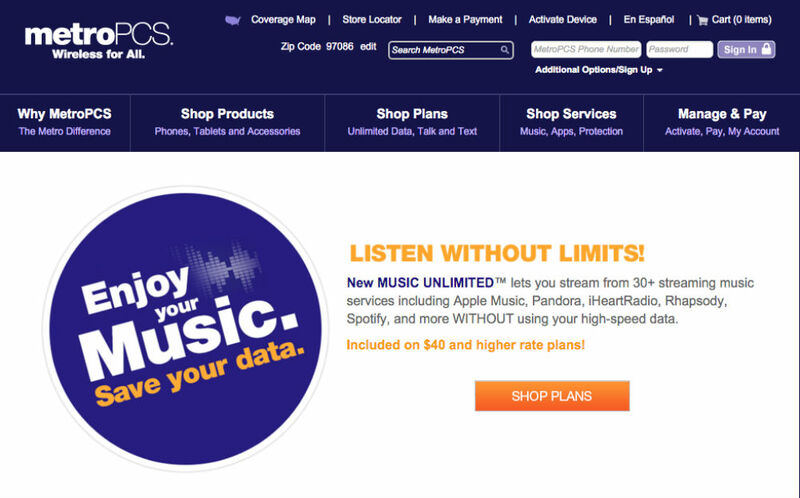 Announced today, Music Unlimited, which is basically T-Mobile’s Music Freedom, allows customers to stream music from preselected services with none of the data counting against your monthly allotment. This feature will be available on all plans priced at $40/month and higher. As for which services for streaming music are supported, there is Apple Music, Pandora, iHeartRadio, Google Play Music, SiriusXM, Tidal Music, Rdio, Spotify, Rhapsody, SoundCloud, and a ton more. Additionally, MetroPCS added 1GB of high-speed data to its $40 and $50 plans, while also boosting Mobile Hotspot tethering on its Unlimited 4G LTE plan from 6GB to 8GB. Data Maximizer, also announced, is utilizing the same technology as T-Mobile’s Binge On, allowing customers to watch up to three times more video while streaming on a data network. It’s not free streaming, but it is properly “optimized,” which means 480p streaming from select services. These changes will go into effect starting Thursday, November 19.